Local Coupon Marketing Testiminial - How local businesses boost local sales in less than 2 months. Do you remember King Wok in Gilbert AZ? The fine Chinese cuisine joint SmartLocalShoppers.com, the fast growing and unique local coupon site, in May. King Wok is one of the local Chinese restaurant that suffer the slow economy. 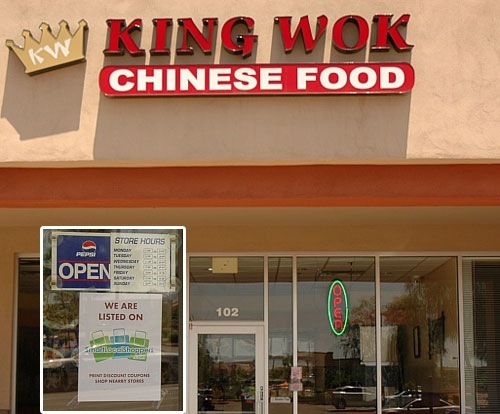 Without proper local marketing strategies and local promotion practice, King Wok had tough time to acquire more local shoppers. Sending out flyers in their own car and end up burn down their car in hot Arizona summer. The owner of the fine cuisine restaurant were so desperate to boost her businesses. After joining SmartLocalShoppers.com, the Chinese cuisine now is receiving great response from the coupons they publish on the web. In less than two months, the store has receive more than 20 coupons and most of them comes back again. This is a great example of using local coupons to boost local business sales. Let’s see what the owner has to say about the new local marketing that helps them boost their local business. We were hesitate to pay for coupon advertisement, because we were paying $300 plus for coupons books that costs too much. We even burn down our own car by sending out menu door to door in the nearby neighborhoods. It’s great to see our own coupons listed on the Internet on the Google home page by search restaurant coupons. Our businesses are usually very slow in the hot summer, but we are surprised that we are seeing more customers after publishing the coupons on SmartLocalShoppers.com. The first few weeks has no coupon at all. Now we are getting more customers. That’s awesome! Thanks to SmartLocalShoppers.com’s CEO, who stop by our store and explain everything. We now understand how local people find coupon online. We can adjust our coupons that will attract more local eaters. One of the King Wok’s coupons reaches 47% printing rate. In other words, 47 in 100 visitors print the coupons. Comparing with the traditional coupon books, only 20 coupons returns in 10K coupons sent out (0.2%) in 3 months. SmartLocalShoppers.com can dramatically boost local businesses sales. Most importantly, it saves lots money! The fact is that SmartLocalShoppers.com can only help local businesses drive more sales, it is still up to the local businesses to take care of their customers by offering their customers the best services and products. King Wok is a great example for other small local businesses to re-think about their local advertisement strategies. Join SmartLocalShoppers.com will help local businesses boost their sales and acquire more local shoppers in the neighborhood or nearby. Are you smart local businesses owner like King Wok? Don’t waste your time! Join SmartLocalShoppers.com and start publishing your local coupons now!